Taeniosis and cysticercosis (T/C) are zoonotic diseases caused by Taenia saginata and Taenia solium. The adult tapeworms are parasites of the human intestine, and show a wide geographical distribution. Taenia asiatica, another tapeworm species, was described primarily in Southeast Asia. The larval stages of these cestodes (metacestodes or cysticerci) cause cysticercosis; T. saginata causes bovine cysticercosis, T. asiatica larvae develop in the pig viscera and T. solium is able to produce cysticercosis in both pig and man. When the parasite larva invades the central nervous system (CNS), the condition is called neurocysticercosis (NCC), one of the most frequent parasitic infections of the human CNS. T/C shows significant economic impacts on the health and meat (pork and beef) sectors within and outside the EU. Laboratory diagnosis of T/C is one of the main objectives of Working Group 2 (WG2); many efforts within CYSTINET are being conducted to circumvent the present problems of disease detection with conventional techniques (microscopy, commercial serological kits) by the use of innovative tools (DNA amplification and recombinant antigens), as well as new approaches aiming to reduce the high cost and avoid the need for expensive laboratory equipment. 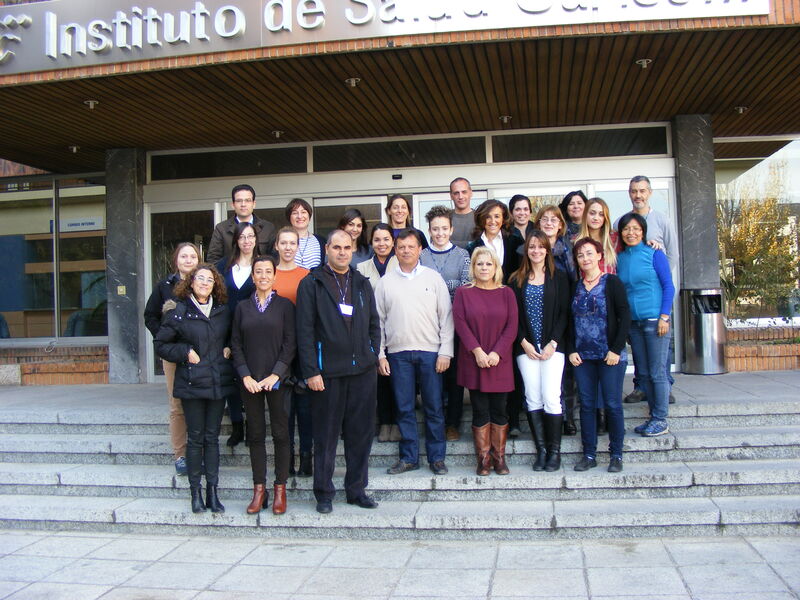 To support these activities, a training school is organized at the Centro Nacional de Microbiología, Majadahonda-Madrid, Spain, in order to increase the capacity in diagnosis research/techniques in all member states. This specific training will focus on the review of different diagnosis methods used in T/C detection, with lectures about the main techniques employed (microscopy, molecular and immuno-diagnosis), discussions about the advantages and disadvantages of each diagnostic approach, and laboratory training. He is a researcher based at the Parasitology Service of the Spanish National Center for Microbiology since May 2013. He is a recipient of a Miguel Servet Fellowship of the Health Institute Carlos III. David’s research focuses on zoonotic diseases caused by protozoan (Cryptosporidium and Giardia) and helminth (Echinococcus) species, with a particular interest in those aspects related to the diagnosis, epidemiology, transmission dynamics, and evaluation of the socio-economic consequences caused by these pathogens, both from the human and veterinary perspective. David received his Ph.D. in Parasitology from the University of the Basque Country (Spain) in 2001. He completed his first postdoc at the Department of Biological Sciences, Imperial College London, UK (2002-04) before joining the Medical Research Council Clinical Sciences Centre, Imperial College London, UK first as a Research Assistant (2005-2007) and later as a Research Associate (2007-13). Bsc in biochemistry and molecular biologist and obtained her PhD in 2004 and MsC in bioinformatics in 2006. She has specialized in microbiology and infectious diseases. Since 2011, is a researcher at the National Center of Microbiology, heading the Bioinformatics Unit. The aim of the Unit is to support ISCIII researchers with their computational analysis needs, focusing his activity in the massive sequencing data analysis. PhD on Microbiology and Parasitology by Universidad Complutense de Madrid. She is graduated in Biochemistry and is a scientist at Leishmaniasis and Chagas Disease Unit of National Center for Microbiology, ISCIII. She participates as a teacher in training courses of the Escuela Nacional de Sanidad and Universidad Complutense de Madrid. Her lines of work focus on the development of diagnostic tools to monitor Chagas disease in terms of serological and molecular detection. As a second line of work, she is involved in the development of molecular tools to be applied to cysticercosis / taeniasis complex diagnosis. She is Doctor in Pharmacy. Head of Parasitology Department at Centro Nacional de Microbiología, ISCIII. Professional background built on both classical and molecular Parasitology, with emphasis on the control of helminth infections. She has been working in onchocerciasis and other filariae infections, trichinellosis, anisakiasis, taeniosis/cysticercosis and fascioliasis, and participated in the development of diagnostic tools and characterization of protective antigens as new vaccine candidates by recombinant DNA technology. She is specialized in Medical Clinical Analysis (1995) and Doctor of Pharmacy by the University Complutense of Madrid (1998). She has developed his professional career in the field of Helminthology, area in which she undertook her PhD. During her postdoctoral stage she was trained in immunology (ASAC Pharmaceutical) and molecular biology (CNM-ISCIII). Currently she is Senior Scientific of the Service of Parasitology at the National Microbiology Centre from the Instituto de Salud Carlos III. She has expertise on various parasitic diseases (mainly helminth infections) as part of research projects mostly aimed at diagnosis, control and immunobiology of these diseases. José Miguel Rubio (Madrid) has a PhD in Biology from the Autonomous University of Madrid. He has been visiting scientist in different European institutions 1989-1998 (University of Norwich, UK, University “La Sapienza” in Rome, Italy, Institute of Molecular Biology and Biotechnology, Crete, Greece and University of Wageningen, The Netherlands). Since 1998 he is member of the Carlos III Health Institute (ISCIII), where I was part of the founding group of the National Centre of Tropical Medicine. He is currently Chief Scientist of the Laboratory of Malaria and Other Emerging Parasitic Diseases of the National Center for Microbiology (ISCIII), Scientific Foreign Visitor of Leonidas and Marie Dean Center (FIOCRUZ, Manaus, Amazonas, Brazil), External Consultant of the Department of Parasitology of the University Cairo (Egypt) and of the Medical Research Center (MRC, Kuala Lumpur, Malaysia) and Spanish Deputy Focal Point for microbiology at the Center for European Diseases Control (ECDC). Applications from early stage researchers (ESR: with at least a PhD and up to 8 years of experience after the PhD*) aiming to contribute to the working group 2 country studies will be privileged and gender balance will be taken into consideration.